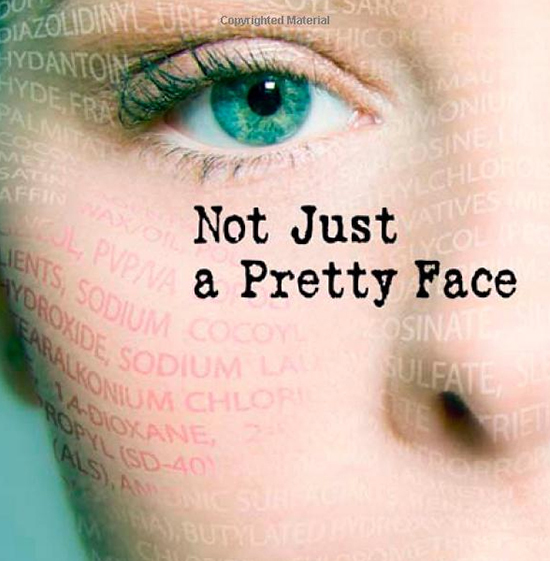 A couple of years ago I read a great book about the development of the Enviromental Working Group or EWG called “Not Just a Pretty Face“. It was a pretty scary book about the politics against women by allowing cosmetic companies to put anything toxic in our cosmetics and toiletries. It made quite a bit of sense. For example, think about how close to your breasts deoderant gets. Not just add some toxic chemicals which are allowed into all products and put it on every day and guess what happens? Cancer, usually. Luckily, I switched to natural deoderants years ago, or at least I thought they were natural. Then I ran out of it and tried to get the same deoderant, but instead I could only find the roll-on version. Several days later my armpits broke out with a red rash that looked like measles. It started to spread. Once I stopped the deoderant I tried to find natural alternatives…salt, essential oils, alcohol, etc. But I notice that my armpits would begin to smell horribly after a couple of hours. Have you ever smelled a little kid’s underarms. They don’t smell really. And so I wondered why adults do. I realized that it probably is a build up of toxins in my body. So then I wondered if there was something I could do to detox and smell better. I then found Chlorofresh from Nature’s Way. I gave it a try by taking two pills a day and guess what? I don’t have to use deoderant anymore–no more smelly armpits. Plus this helps with bad breath and foul odors. There are studies that suggest a correlation between this substance and cancer suppression. So it’s all a win.